This software has been discontinued by Algorithmic Arts. It supports modules just as it might sit on top of a big Moog analog synthesizer or your soft synth, MIDI module or sound card. 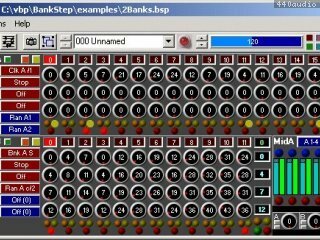 The main module in BankStep is the Bank module, which is a 3 or 4 bank knob sequencer of any number of columns up to 48. The Bank module is a "smart" module, with the ability to set sequence start and end points, and to automatically switch direction when the end points are reversed. There are no dangling patchchords in BankStep. Instead, module inputs (the red and blue buttons) connect to outputs by selecting them from a popup menu of all available outputs. When an input is connected to an output, the input button label indicates the connection.